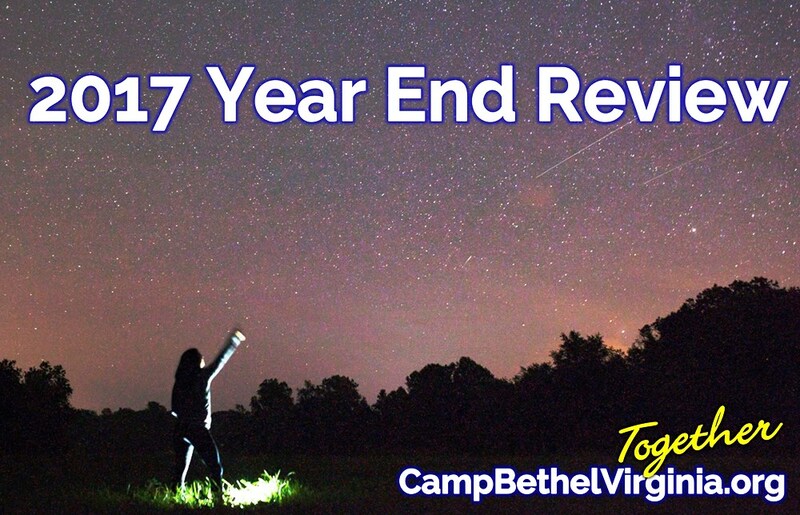 2017 at Camp Bethel was amazing, challenging, and record-breaking. 1,212 children and youth (record) participated in our Summer Camps, including: 429 in 6-day Resident Camps; 127 in 3-day Resident Camps; 65 in Elementary Adventure; 87 in MS/HS Adventure; 71 in Trips; 12 in Specialty/Skills; 72 in P/C Overnight; 274 in Traveling Day Camps; 31 in on-site Day Camps; 44 in Family Fun nights. Of the 782 who answered, 385 identified as Church of the Brethren (49%), 397 as other denomination (51%). 216 campers received Good-As-Gold from Virlina congregations totaling $50,407. 87 received "Camperships" totaling $25,715, for which our December 7 Christmas Together Banquet raised the final $8,558 needed to cover all 2017 Camperships AND provide Camperships during our Dec 30-31 Winter Camp. Fundraisers accounted for $93,665 (12%) of our total income in 2017, including: Sow the Seed Banquet on March 2 raised $5,415; Sounds of the Mountains Festival April 28-29 raised $27,073; Benefit Golf Tournament August 23 raised $12,480; 5K on August 26 $3,665; Heritage Day October 7 raised $36,475; Chrismas Together Banquet December 7 raised $8,558! Gifts to Camp (individual, memorial, campership) total (thus far) $57,062 (7%) of our total income in 2017! Consider a YEAR-END GIFT TO CAMP BETHEL. Our inaugural “Camp Bethel PEP! 5K” on August 26 had 89 runners, 24 volunteers, and 13 sponsors raising $3,665! Our next PEP! 5K is August 25, 2018. On August 1, we welcomed Elizabeth Haley as our new Food Services Coordinator. In addition to our 1,212 summer campers, we hosted Camp Kesem's 108 campers, three band camps totaling 357 campers, and 22,920 guests in retreats, events, special programs, and Your Outdoor Classroom and KinderCritters outdoor education. In 2017 we hosted guests on 46 of 52 possible weeks and weekends! Camp Bethel in Fincastle, Virginia is owned and operated by the Virlina District Church of the Brethren (Federal Tax ID# 54-6043879) a 501(c)3 non-profit organization with offices in Roanoke, Virginia, so gifts are tax-deductible in the year given. Thank You for your gift! Your gift and your information is kept confidential. All gifts are fully tax-deductible for the year in which they are received, and we will send you an annual tax/gift letter. STEP 1. 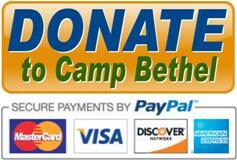 Clicking the "DONATE" button below takes you to Camp Bethel's secure PayPal "Donate to Camp Bethel" site. The payment page looks like this. BE SURE TO CLICK THE [ + ] AND TYPE YOUR NAME. ​STEP 2: Simply enter your payment amount and your information. Either pay with credit/debit card or create/log into your existing PayPal account. Be sure to check the box "Share my mailing address with Camp Bethel" so that we can match your payment to you and to your address. STEP 3. You will receive a confirmation e-mail from PayPal showing your successful donation to Camp Bethel, AND we will send you a Thank You letter including tax information.